Greens—the Most Nutrient-rich Foods in the World (part one) | Audio and video stories from Southwest Washington. It is ironic that the most nutrient-rich foods in the world, leafy greens, are also the most under-eaten food in our nation. While all vegetables offer exceptional health benefits in varying capacities, scientific research on greens has skyrocketed over the past seven years, revealing that greens rank the highest of all based on their calculations of vitamins, minerals, phytochemicals and antioxidant capacities. In other words, greens are the most nutrient-rich food on our planet and those who desire to eat healthy should consider eating them as often as possible. While knowledge is power and understanding the “why” behind eating greens is essential to having the motivation to eat them, knowledge and understanding are of no significant value unless there is practical application in our daily lives. The single most asked question following my teachings on greens and healthy eating is, “How do I eat them?” Great question! 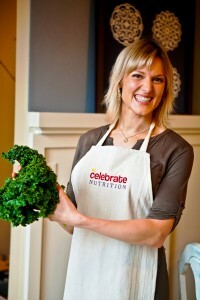 Here are my insights into how to eat the most nutrient-rich foods on our planet in delicious and practical ways. Which vegetables are considered greens? The most common and nutrient-rich greens include mustard, turnip, and collard greens, kale, watercress, bok choy, spinach, broccoli rabe, Chinese (napa) cabbage, brussels sprouts, swiss chard, and arugula. An easy way to begin identifying them in your local grocery store is to ask a produce grocer to point them out to you. Not only is this great “homework” for your grocer but it also casts a vote with your local grocery store by communicating a message that the supply of greens are in demand. 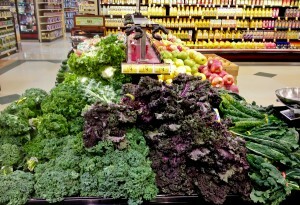 I personally have witnessed the organic greens section tripling at the Fred Meyer store nearest to us (see my picture) as well as east Vancouver’s Costco now supplying huge bags of pre-washed baby kale over the last year for this very reason. Where can I buy them? Greens can be found nearly everywhere! Once you have learned the names and identified them visually, you will find yourself noticing them at grocery stores where they were previously overlooked. Locally here in Clark County, we are exceedingly blessed to have Fred Meyers, Chuck’s Produce, New Seasons, Whole Foods, Costco, Trader Joe’s, Safeway and dozens of other wonderful resources which are abundant in a variety of greens. Other wonderful options include buying from your local farmer, CSA, or growing your own in the garden. Greens such as kale and collards not only grow year round but are even sweeter tasting in the winter due to the plant’s design in which it the stems pump sugar into the leaves as a natural anti-freeze. For being the world’s healthiest foods, it would seem the cost should be pricey but the average price of a large bunch of fresh, organic greens is only about $1.99. Now that is getting the most bang for your buck! What if I do not like them? Real questions are refreshing—and here is a real answer. Truth be told, our tastes are learned and just like a muscle which requires training, our palates can learn not only to tolerate but even to prefer and enjoy greens! While the vast majority of Americans only know greens to be a doily decorating a fruit platter, there are numerous varieties of greens and ways to prepare them both easily and deliciously. I recommend starting small and slow with sweeter greens like swiss chard, kale, and spinach before venturing into some of the stronger flavored greens like arugula and mustard greens. As often as possible! There are far too many disease preventative health benefits to neglect eating these vibrant foods regularly. Healthy habits are built with consistent baby steps. Should I eat them raw or cooked? Both! 50% cooked and 50% raw is a great balance but there is no need to get technical—just be consistent. Is it necessary to buy organic greens? Greens are among the dirty dozen vegetables that are most contaminated by pesticides and they are also very quickly assimilated into our bloodstream. For this reason, it is in your best interest to prevent excessive exposure to harmful chemicals by eating clean, organic sources of greens. If it is not possible to buy organic then do not it let deter you from eating conventionally grown versions because the benefits of eating more greens will still merit great rewards. Stay tuned! This is where the “rubber meets the road” and the practical application of nutrition takes root in our lives. Next week I will share over a dozen ideas and recipes on how to creatively, tastefully, and simply delve into the wonderful world of greens so that they become a regular part of our diet.